You may not be aware of this, but the Portuguese are excellent bakers and pastry makers, each famed for their traditional local pastries. If you haven’t nibbled your way through Lisbon, savoring their varied and highly addictive pastry culture, let us to tempt you! Pasteis are pastries in Portuguese, and the Pasteis de Belem is one of the oldest and most renowned in Portugal. The tradition dates back to the early 1800’s when the Mosteiro dos Jerónimos was shut down after the Liberal Revolution. Needing a means to survive, the monks used the sugar from the sugar cane refinery connected to the general store to produce sweet pastries. In 1837, they stopped selling through the general store to open a bakery, catering to both locals and visiting steamboat tourists alike. These mini egg-custard pies with a crisp, flaky crust are made from the monk’s ancient, top-secret recipe. It has remained unchanged, passed down only to the master bakers, who still hand-craft them in the “secret room” in the bakeshop. The Pasteis are normally served warm out of the oven and lightly sprinkled with sugar and cinnamon. Today, the Pasteis de Belem bakeshop is still hugely popular. And though it may look small from the outside, it is quite extensive and windy in the back, with many individual dining rooms decorated with old traditional Portuguese blue and white tile art. Yet, despite its size, the lines on the weekend go all the way out the shop into the street! I was smart this time to come on a weekday night. And since there’s no menu, as they only serve Pasteis de Belem, you’re only job is to decide how many and what to drink with them. I asked my waiter to bring me a wine that is typically drunk with the pastry. Judging from the vast number of Port bottles displayed on the shelves, it was no surprise when he came back with a glass of Ferreira Dona Antonia Reserva Port. Aged 8 years in oak casks, this port has the ripe fruits of a Ruby with the nuttiness and spice of a Tawny. Ferreira happens to be one of the best-selling Ports in Portugal, and also one of the oldest houses, so I could see how it might pair well. However, it had such a powerful, spicy finish that it literally overwhelmed my palate, masking the lighter, creamier flavors of the Pasteis. Port may be the traditional pairing with this pastry, but I would suggest a Moscatel de Setubal from JP Vinhos, or Jose Maria da Fonseca, which are smoother and sweeter, but still match the richness of the creme-brulee like Pasteis. Tip: you can find the generic version of Pasteis de Belem called, Pasteis de Nata, all around Lisbon. 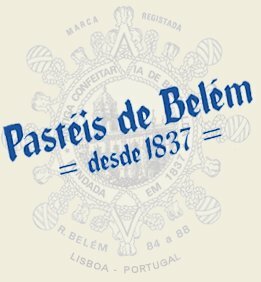 So don’t make the mistake of asking for Pasteis de Belem outside of their bakeshop! It’s still good, but not as good as the original.